Every one of us has a story we can share. Think of a past event in your life related to GBMC. Whether it’s care you received, an opportunity you have, or a loved one you remember, this event should have very personal meaning to you. What’s happened in your life since your experience at GBMC? Read Priscilla Scott’s story below, and share yours at www.gbmc50.com/mystory. Priscilla Scott's Story: "Doctors Treat You Like Family"
My daughter and granddaughter started coming to GBMC long before I became a patient. I have had diabetes, high blood pressure and other health complications for quite some time and was receiving care from another primary care doctor in Baltimore. One day, I brought my granddaughter to her pediatrician’s appointment at GBMC and I immediately saw why my family spoke so highly of their doctors. I loved the way that the doctor took care of my granddaughter, treating her like family. After that experience, I changed doctors and became a patient at Family Care Associates. I wanted better care for myself and the location is more convenient for me too. I have been a patient here for five years. My family and I all now have the same family care physician. Dr. Mathey really helps me monitor my blood and sugar levels to take control of my diabetes. 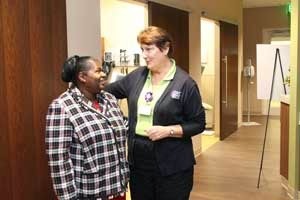 Both Dr. Mathey and Anne Conrad, the nurse care manager, teach me how to take better care of myself. At every appointment, we talk about good eating habits and different types of healthy activities I can do. She also helps me to stay connected with specialists like my podiatrist. I could not be more satisfied with the care that GBMC gives me and my family. On a scale of one to ten (ten being the best), we would give them a nine because nobody is perfect, but GBMC is the next best thing! Dr. Mathey helps us understand how we can continue to stay healthy and how we can improve while providing great resources. Whenever one of us needs an appointment, Family Care Associates makes time for us as quickly as they can. I feel like my family and I are a part of a larger family at GBMC. They know our names, who we are and even remember our discussions from previous visits. Everything is very organized and taken care of in a timely manner, which is very important to me. I couldn’t be happier with my decision to become a GBMC patient. In need of a primary care physician? Visit www.mygbmcdoctor.com to find one who is right for you. Cholesterol on its own is necessary for building new cells throughout the body, insulating nerves and producing hormones. The liver makes this necessary cholesterol, creating it in exactly the quantities that the body needs to remain healthy. When cholesterol is introduced into the body from foods, including milk, eggs and meat, it begins to stockpile in the blood and build up in the arteries. This can lead to a narrowing of the arteries, increased stress on the heart and heart disease. Waiting for signs or symptoms of plaque buildup to occur may be life threatening as IVD typically does not cause symptoms until the artery is severely narrowed or totally blocked. The best prevention of high cholesterol and IVD is to work with a primary care physician to have cholesterol and lipid (fat) levels checked through blood tests. This will allow the physician to detect possible plaque buildup in the arteries before blood flow is impacted. Treating IVD can be completed through medications to control blood pressure and high cholesterol or routine surgeries to remove plaque buildup. Other treatment options include smoking cessation, dietary changes, maintaining or achieving a healthy weight and incorporating more physical activity into your daily routine. For more information about IVD and cholesterol levels, visit your primary care physician. 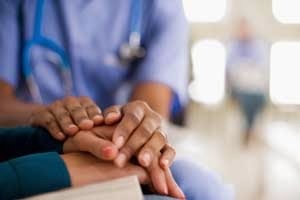 To find a physician who is right for you, visit www.mygbmcdoctor.com or call 443-849-GBMC (4262). You have made it to month three of your Couch to 5K training, and that is truly something to celebrate! If you are interested in running your first 5K but have never run before, complete month one (Tips for Starting Out) and month two (Your Second Month of Training) before advancing to the plan below. Consult with your primary care physician before beginning any exercise program because your health and safety are the most important elements of any exercise regimen. 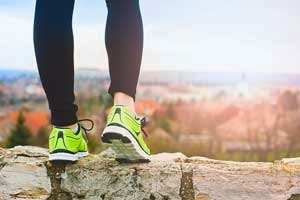 In month three of your Couch to 5K preparations, you will focus on more running, more cross-training and how to run in non-flat race situations. You will test your skills to see how far you’ve come, hone in on healthier decisions, hydrate frequently and start to get excited: Your first 5K is only a month away (If you haven’t signed up for the GBMC Father’s Day 5K, register now!). At least once per week, perform some kind of cross-training (for ideas, see Exercises for a Fitter New Year). If you have yet to sign up for the Father’s Day 5K benefiting GBMC’s NICU, visit www.gbmc.org/5k for information and to register. And stay tuned for the last installment, “Tips for Your First 5K,” coming in June. See you at the race! 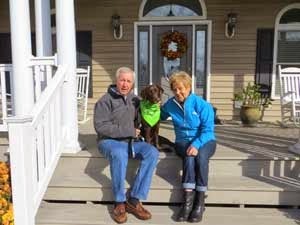 For Bill and Audrey Sento, retired education professionals from Ridge, MD, chronic hip pain due to osteoarthritis robbed them of the active life they had planned for themselves. Both patients of Leroy (Lee) M. Schmidt, MD, Bill had his left hip replaced in August 2013 and his right replaced in July 2014, and Audrey had her right hip replaced in February 2014, which has given them the opportunity to enjoy their retirement. This is their story, in their own words. Bill: “We decided that we wanted to golf when we retired, and are now well on our way to that goal. I am also now able to ride a bicycle and fish, both of which I had a difficult time doing before surgery. Of all of the things Mr. and Mrs. Sento appreciate about their experiences at GBMC, the accessibility and caring of the staff are the most prominent. For more information about orthopedic surgery at GBMC, visit www.gbmc.org/orthopedics or call 443-849-GBMC (4262). Preheat a broiler or grill on medium-high heat. 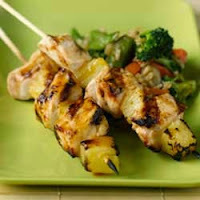 Thread three chicken cubes and three pineapple chunks alternately on each skewer. Combine ingredients for sauce and mix well; separate into two bowls and set one aside for later. Grill skewers for 3–5 minutes on each side. Brush or spoon sauce onto chicken and pineapple about every other minute. Discard the sauce when done with this step. To prevent chicken from drying out, finish cooking skewers in a 350°F oven immediately after grilling (to a minimum internal temperature of 165°F). Using a clean brush or spoon, coat with sauce from the set-aside bowl before serving. Recipe Source: Reprinted with permission from Keep the Beat™ Recipes: Deliciously Healthy Family Meals. U.S. Department of Health and Human Services. National Heart, Lung, and Blood Institute. NIH Publication No. 10-7531. Page 13. December 2010.